A complaint filed against a ticket of four candidates for Brick Township Board of Education alleges the candidates failed to file mandatory campaign finance disclosure reports with the state and may have commingled finances with a separate slate of candidates for township council. The complaint, a copy of which was provided to Shorebeat on the condition of anonymity, lists four candidates as its subject: John Lamela, Stephanie Wohlrab, Victoria Pakala and George White. 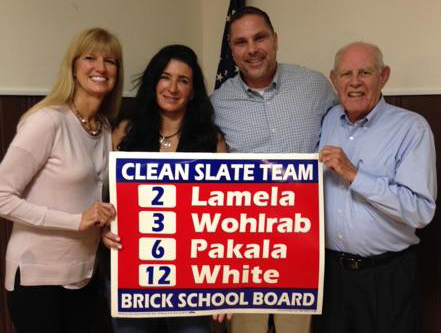 The group ran as the “Clean Slate Team” for their board seats, all successfully, and will take office Jan. 1, 2016. Though elections for board seats are technically nonpartisan in New Jersey, it is common for slates of candidates to be tacitly backed by political parties. The Clean Slate team was aligned with the Democratic party in Brick. The complaint filed with the state Election Law Enforcement Commission alleges the slate of candidates failed to register with the commission, nor did it file any documents detailing the sources of its finances or spending. Indeed, records from ELEC show the campaign only filed one form, known as a D-2 form, Nov. 25, three weeks after the election took place. The D-2 form establishes the four candidates as a ticket known as a joint candidates’ committee. Still, no reports on campaign spending are listed as having been filed by ELEC. In New Jersey, candidates running jointly for boards of education are required to file the C-1 form, listing all contributions in excess of $300 in the aggregate from one source in an election. The C-1 forms, if required, are to be filed 29 days and 11 days before the election and 20 days after the election, and within 48 hours of receiving any contribution $1,400 or more within the 13 days leading up to election day. If a group of candidates spends more than $12,300, they must also file an R-1 form, which is a more complete accounting of the campaign’s donations and expenditures, and lists all contributions in excess of $300. Though as of Dec. 7, records from ELEC show the C-1 form had not been filed, Mitch Seim, a campaign representative provided Shorebeat with a copy of a C-1 form that he said had been sent to ELEC. According to the form, the campaign received $1,600 donations from each of its candidates for a total amount of $6,400. Donations under $300 do not need to be reported. Seim said each of the candidates filled out forms designating themselves as candidates in August, but the forms were mistakenly never mailed to the state. He also said the campaign spent less than $12,300 and did not need to file any R-1 forms. The complaint alleges, however, that the campaign likely spent a significant amount of money, with the filer asking the state to look into the possibility that the school board candidates used money from the Democrats’ township council campaign to fund their own. The school board candidates sent out two glossy mailers and had lawn signs printed up that were displayed around town. The forms obtained by Shorebeat do not list the costs of the mailers, but the average prices of such documents can be obtained by reviewing similar expenditures from the township council race. In the case of the Democratic council slate, a sample of campaign finance records reviewed indicate postage for three mailers cost $8,678, $4,684 and $2,918. Mailers are often delivered to varying segments of the town, based on party affiliation, geography and other factors. Printing bills ranged from $16,484, to $9,300 to $3,621. The GOP candidates spent similar amounts on their mailers, records indicate. ELEC is now tasked with determining the validity of the complaint and, if necessary, launching an investigation or an audit. Complaints are considered confidential, and ELEC spokesman Joseph Donohue said he could not comment on any complaints that may have been filed with the agency. Speaking in general terms, Donohue said violating state policies related to filing campaign finance reports can carry fines of $7,600 per incident.